The Train departs from a terminus next to the Domus Romana outside Mdina. The sightseeing train tour provides an informative commentary on the historical, cultural and architectural importance of the area whilst providing great fun for all the family. 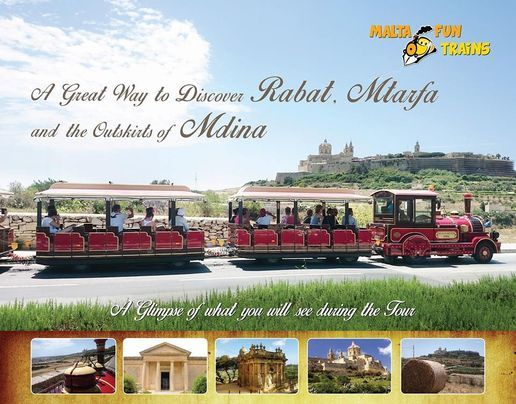 The tour’s duration is approximately 30 minutes with an 8km route that passes close to Mdina Main Gate and Casino Notabile, entering into the heart of Rabat next to St. Paul’s Church, the catacombs of St. Agatha and St. Paul’s and thereon into Ghar Barka outside Rabat. 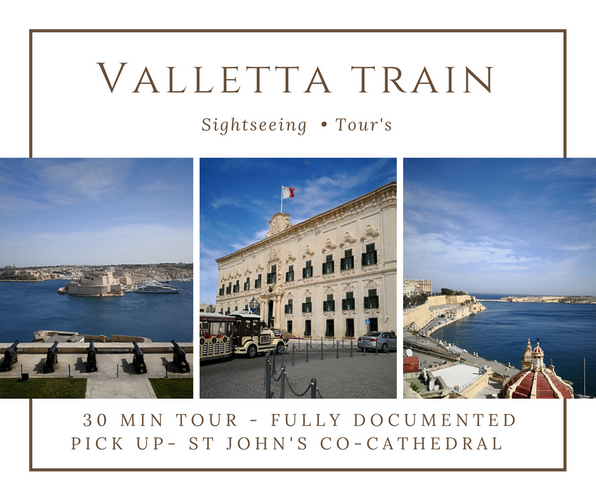 The train proceeds into Mtarfa viewing the Royal Navy Hospital and the Clock Tower then downhill with magnificent and panoramic views of Malta and the old capital Mdina. The train passes over the bridge close to the Old Railway Station and thereafter up the steep hill close to Mdina Bastions and through Greek Gate Tunnel before ending the tour at the terminus next to the Domus Romana. Departure from next to St. John's Cathedral. The tour departs right next to the Bus terminus and proceeds to explore the seaside area and its many restaurants, shops, bars and hotels. The train also goes into the older part of St. Paul's Bay (which Bugibba forms part of) passing by the Wignacourt Tower and an impressive chapel built by the Knights. 10:00, 11:00, 12:00, 13.00, 14:00, 15:00, 16:00.